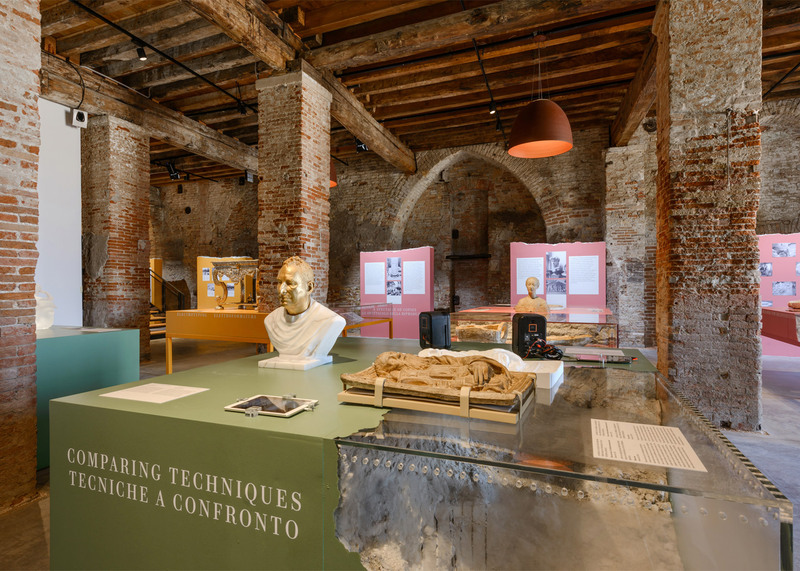 Venice Architecture Biennale 2016: scale reproductions of Nefertiti's bust and a shelter used by refugees in Calais' Jungle are among the myriad replicas of cultural artefacts included in a V&A-curated show about the value of copying (+ slideshow). 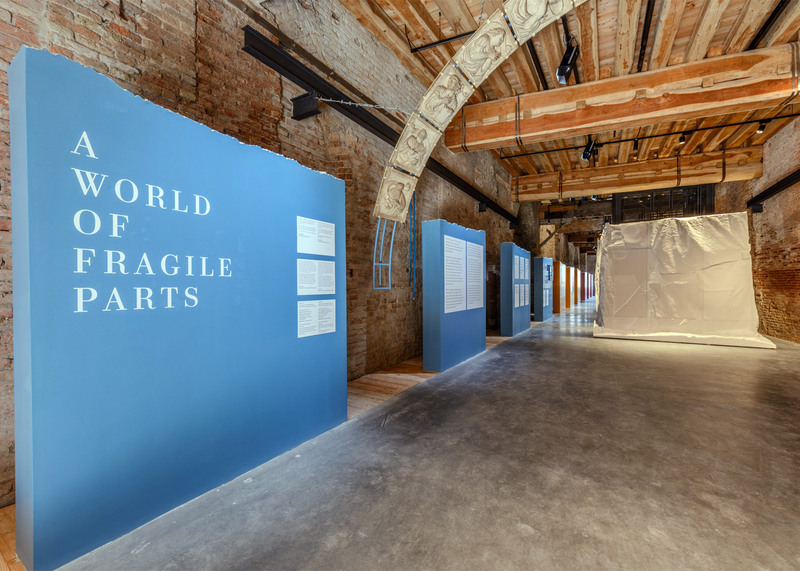 The exhibition titled A World of Fragile Parts is one of a handful of special projects at this year's Venice Biennale, which run separately from the national pavilions and the central exhibition spaces of the Arsenale and Giardini venues. Put together by V&A curator Brendan Cormier, it shows how scanning and digital fabrication techniques are being applied to preserve cultural artefacts at risk of destruction though natural disaster, violent attacks, urbanisation, tourism and neglect. The V&A museum in London is well-known for its Victorian-era Cast Courts, which house plaster replicas of historic sculptures and building fragments, originally created for people who were unable to travel to see the originals. 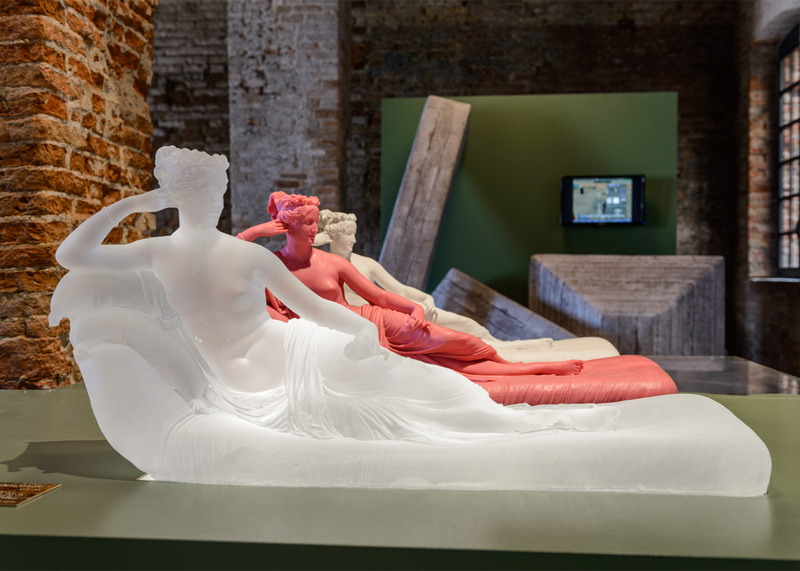 In the Biennale exhibition, plaster casts dating back to the 19th century are positioned alongside examples of 3D-scanned and printed objects to demonstrate how the focus and methods of replication have progressed. "The idea to do a show about copies was to respond with urgency to the issues being raised by many initiatives working on digital modelling and reconstruction of lost cultural artefacts in the Middle East," curator Cormier told Dezeen. 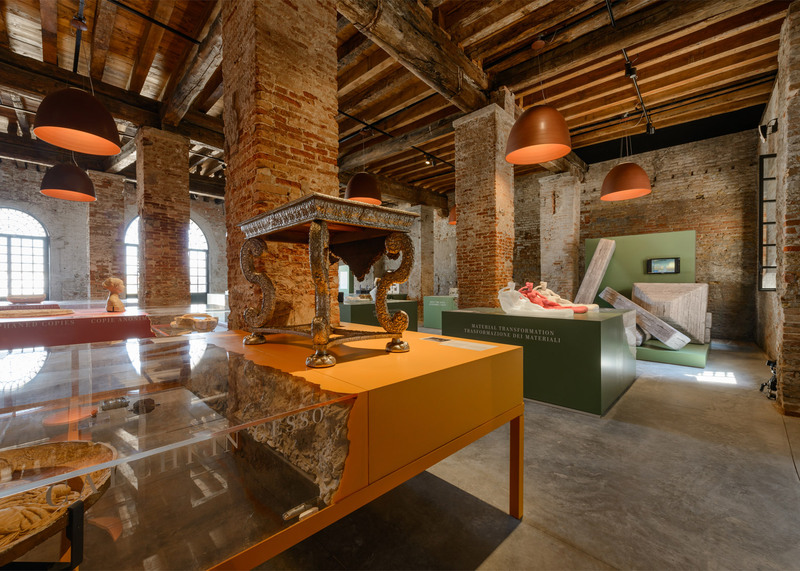 "Those initiatives have helped bring to light the power of new digital scanning and fabrication technologies to do the seemingly impossible – to bring lost artefacts back to life." 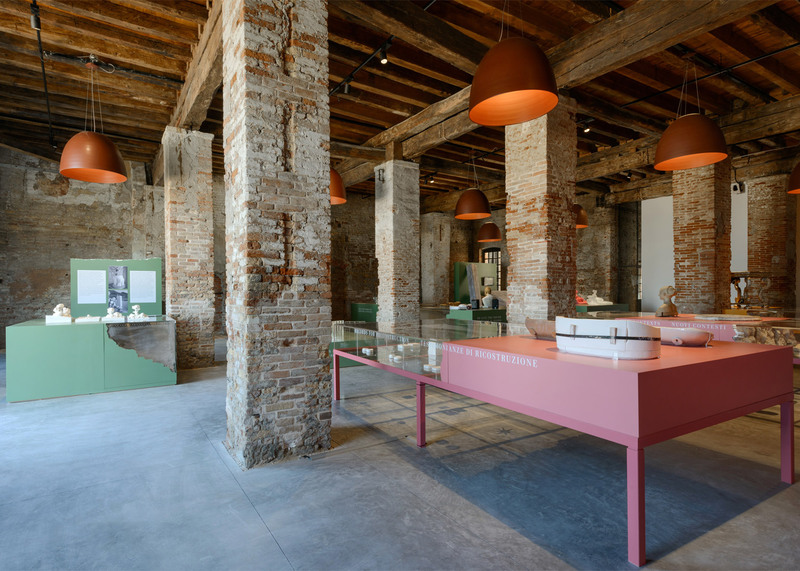 Cormier believes preservation through copying is vital for the study of culture and design. 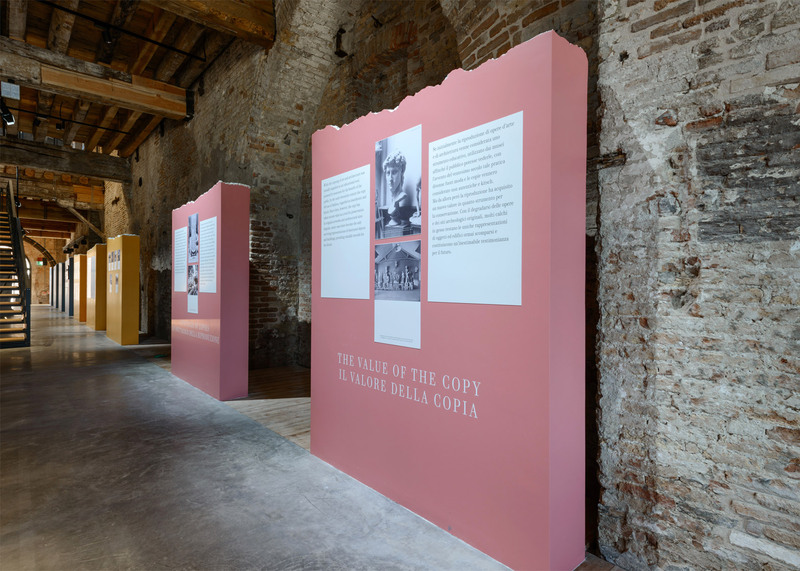 "We wanted to bring some focus to projects working at the frontline of digital archaeology, but also to give it historical context that the museum's own copying traditions could provide, and speculate on the power of the copy as a device that can help not only preserve our material culture, but become a resource for artists and designers to use," he said. Contemporary exhibits include the contentious 3D print of Nefertiti's bust created by artists Nora Al-Badri and Jan Nikolai Nelles, and a fragment of digitally carved marble modelled on Palmyra's Arch of Triumph, which was destroyed by an ISIS attack last year. British architect and Dezeen columnist Sam Jacob has created a full-scale replica of a refugee shelter by using 3D scans taken of a hut in Calais' infamous migrant camp. The piece called Dar Abu Said, named after its Sudanese inhabitant, is made from pale CNC-milled synthetic stone. 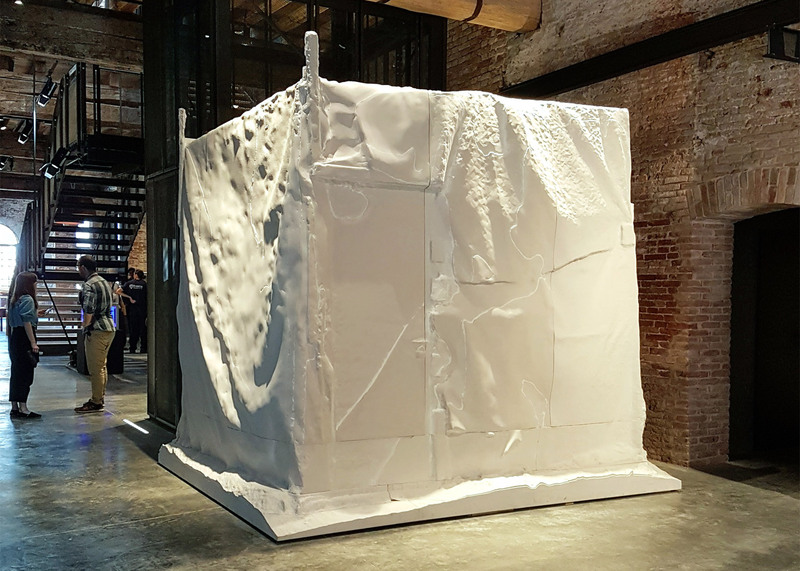 "The installation brings part of the humanitarian and political crisis affecting the Middle East and Europe, into the Biennale," Jacob told Dezeen. "The data held within the structure bares witness to the current situation at the Jungle in Calais, where approximately 5,000 people live in temporary shelters of this type." "It also explores the possibilities of new digital technologies to preserve the immediate present, to document a form of architecture and situation that is in such urgent flux," he added. "Might these forms of copy now sit alongside the triumphal monuments of the victors that characterises collections such as the V&A's own Cast Courts?" 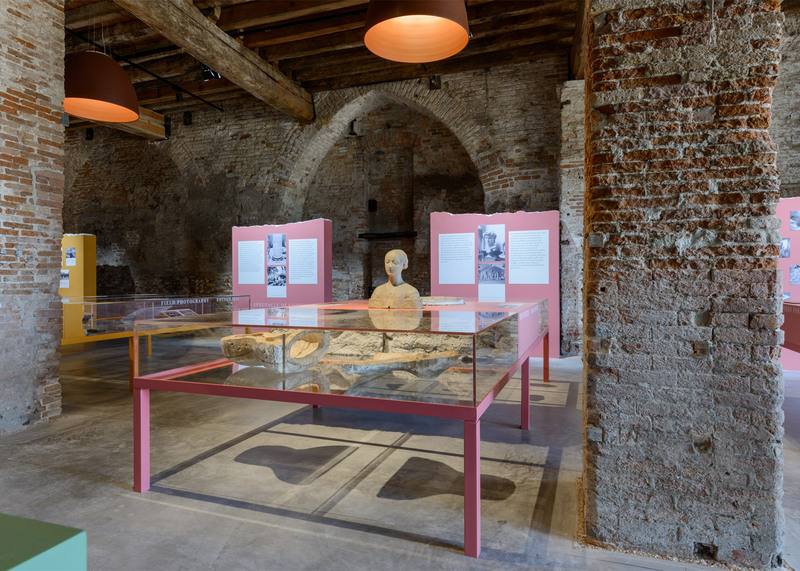 The exhibition design created by Ordinary Architecture directors Elly Ward and Charles Holland includes fragmented pale pink columns as information boards and display cases with craggy-edged coverings. The show is part of a wider programme by the V&A focusing on how developments in technology are impacting architecture and design. The South Kensington-based museum is currently hosting a robotically fabricated pavilion in its courtyard, and has plans to open a branch named V&A East in a new cultural district at the Queen Elizabeth Olympic Park in east London to focus on designing for the digital age. The 18,000-square-metre museum will form part of the Allies and Morrison and O'Donnell-Tuomey masterplan for the grounds around the Zaha Hadid-designed London Aquatics Centre, which will also include a new Sadler's Wells theatre, and campuses for the London College of Fashion and University College London. Photography is by Andrea Avezzù and Sam Jacob Studio.